I woke at a sensible hour, seeing as how I hoped to arrive at Disney's California Adventure at 9:30, and first had to pick up Jillian. Now, Jillian does not watch soaps. She only knows who Susan Lucci is, and Finola Hughes (From her stint on Charmed). So, we headed there, made it by 9:30, only to discover the lines for Rebecca Budig and J. Eddie Peck were full. 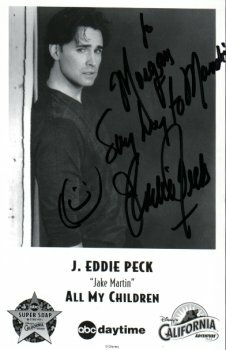 So, we headed to another line and it ended up being for J. Eddie Peck. I waited, and sent Jillian to get in line early for Alicia Minshew. While in the line for J. Eddie, Walt Willey walked by, looking very dapper and handsome. Finally got up to J. Eddie. He stood and asked me my name. I told him. Then, I told him, 'My friend, Mandie, from Illinois wants me to tell you she loves you.' Then he said he appreciated it and next thing I knew he was asking me how to spell her name. See below picture of J. Eddie Peck. I then had my picture taken with him. He wore all black, and looked very good. His eyes are very blue in person, his eyelashes are to die for. He smells fabulous and he is very tall and gracious. Next came Alicia Minshew, but we'll wait till the end for the recap of her. After Alicia we noticed the line for Elizabeth Hendrickson was rather short. So, we went there. Her line was short and we got up there in no time at all. I told her that she was wearing cute shoes, because she was. They were this suede type sandals. She was wearing this cute long, green suede coat over jeans and a peasant top. Next, we watched 'Cavalcade of Stars'. Now, I'm told when they do this in Florida, that they have a car/float for each star, or two stars. This time Disney huddled them all on one quickly moving float with Mickey and Minnie whilst playing the AMC theme. However, I did get to see everyone on that float (Except Cameron, read on). After that we went over to the Pine Valley Live Q&A hosted by Ms. Linda Dano. Two hours we waited and we got in the front row in the middle. Awesome seats. Worth the wait. Especially considering the five people they had lined up for that one. So, I sat in the front row gazing upon Eden Reigel, Elizabeth Hendrickson, Alicia Minshew, Jack Scalia, and La Lucci herself. Ms. Dano is so classy and elegant. While in line for this Finola Hughes and Terri Ivens walked right by us. Finola wore a peasant skirt and olive green tank top. Quite different from Anna Devane, very nice looking, beautiful woman. Terri Ivens is much more beautiful in person too. The Q&A had some good laughs, it was lots of fun. Eden is gorgeous in person. She wore jeans, this black shirt, and black heeled boots. Jack Scalia wore a perfectly matching beige suit. He's very funny. Lucci wore a red dress and black leather jacket (Yes, THE ERICA JACKET). 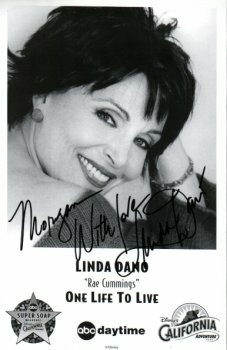 Afterwards we went and stood where the stars came out and got to meet Linda Dano. I told her that my mom and I had seen her on a taping of Howie Mandel with Jason Alexander. She was touched I remembered the guest list so well and told me I had a pretty name. She wore an all white suit and was very cold. Then, we walked through their hotel and saw Lucci walk by surrounded by guards, we'd have stopped her if we'd realized it was her sooner. We over slept by an hour and a half. But, we made it twenty minutes earlier than we did the previous morning. This being due to the fact I did not have to wait for Jillian to get ready. Anyway, the first line was Alicia Minshew. Yes, saw her the day before, but read below and I'll explain. 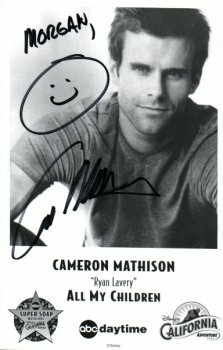 Then, after that, at about 11:00 we went into the line for Cameron Mathison. Here's what happens. His lines fill quickly and they only let 85 people in at a time. We were in the first five people and within an hour after we lined up, the line was completely full. So, four hours we waited for him. While waiting, though, we got to hear three more of the Q&A sessions with every single one of the actors, which was nice. Also, Jack Scalia came up and started taking pictures with the crowd, I got mine in too. He's quite the gentleman. Also, the 'Cavalcade of Stars' went through at this time as well. I videotaped it. Also of note for all 'Ryndall' fans, I ate a corndgod while waiting for Cameron. FINALLY, 3:15 came and we got to meet Cameron. Did he take his shirt off? Yes. Anyway, it was now my turn. I went up to him, he put both arms around me, he smelled wonderful. He wore this green v-neck shirt (Sometimes) and pinstripe pants. His eyes are brighter and lovlier in person too. I got my picture signed. And then I told him I was working on the very first Ryan and Kendall fan site. He was pleased, since there were a lot of people not quite willing to let go of Gillian yet. And, when he talks to you, he looks into your eyes. Now, a side note to all these things. My mom was walking and ran into Michael E. Knight. She had no camera, so he told her he wanted to give her a hug. He's very handsome. So is John Callahan. My mom also saw David Canary. Okay, so after Cameron we walked, saw Finola, and decided, hey Amelia Heinle's line is short, we'll do that. So, we waited for Amelia, finally it was my turn. I told her that I loved her scenes with Liza this past week. Told her Greenlee was inconsistant, asked about Jake and Mia. Her words: It's gonna happen, it'll take some time, but... She was very sweet, when I told her I did not hate her character when she first arrived (I really didn't, I wait and give characters a fair chance before I hate them.) she told me she liked me. She signed a picture, and we took a picture. Now, I did not meet everyone. But I got to see everyone, which is really the important thing. The ones I did meet were amazing. Now, on to my favorite person of the weekend, Ms. Newbie herself, Alicia Minshew. I was one of the first in line for her very first autograph sessions in her career. Now, this girl is tiny tiny tiny. But she looks healthy. She had on this powder blue halter, jean jacket, black skirt, and cute little shoes. Very arresting eyes. A million times more beautiful in person. My opening to her was, 'Gee you're tiny'. She told me I was too, then told me I was cute. Anyway, I told her of the very first Ryan and Kendall website and she opened her mouth really big and yelled, 'YOU E-MAILED ME!' (See why I like her already?) So, I said yes. She said she meant to write back, I told her it was okay. Then I told her that I loved Ryan and Kendall more than I liked Ryan and Gillian. Her mouth dropped and her eyes went wide and she put her arm around me. Then she signed the picture and we took one. Later at the Q&A she seemed do happy and gracious to be there. They asked her and Eden how it was to be working with La Lucci and Alicia actually started tearing up saying how nice La Lucci has been to her. It was a sweet moment. Now, I was supposed to get a magazine signed for Laura, but it did not arrive. So, Sunday morning I got in line for Alicia again and she signed a picture to Laura. I told her I liked her so much the first time, I came back (Which really was true). She then opened her arms in excitement. Then I gave her the website address on my business card and she thanked me for taking the time to do this. I told her that meeting her this weekend made the site all the more worth it and she pulled me into a large hug. Then we took a picture together. Here's why I am now such a huge fan of Alicia Minshew's. She's genuine. You could honestly tell seeing her that she was happy to see you and that she remembed me from the day before. She's excited to be there, excited to meet the fans, and loves her job. They told her to hurry things along and she didn't. She gave so much time to the fans. She has an energy and exuberance about the entire weekend that simply rocked. After meeting her, I absolutely adore her. Not only as an actress, but as a person. They also had this thing where you could go and find out what AMC character you were most like between Erica, Edmund, Tad, Greenlee, Anna, and Brooke. I got Tad (??? ), Greenlee, and Brooke (See below). They also gave out lipstick shaped pens, mints, and I bought two pins. I ran into a group of Finola Hughes fans (All itendified by their FINatic tee shirts) they gave me a Finola button (See below).